It looks like it might be about time for your iPhone to have another "accident". 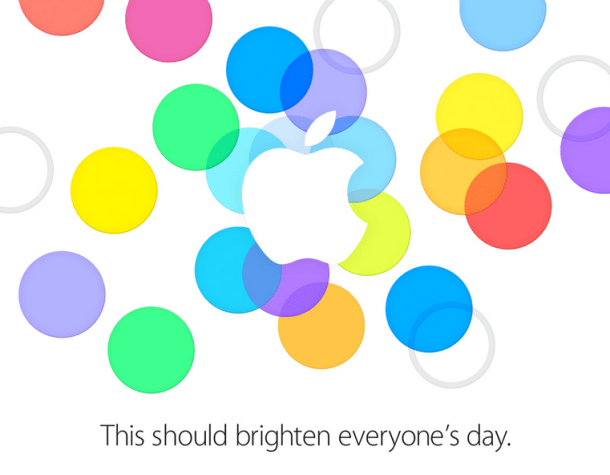 Cnet, Slashgear, and the rest of the blogosphere is reporting that Apple has sent out a round of invites today. No one has any specific details about what is going to be launched at the event, but we do know that it will be held next Tuesday at Apple's headquarters in Cupertino, Calif.
My current guess is that Apple will launch the new iPhone (possibly even 2 models). There have been a plethora of leaks for that color iPhone these past few weeks which haven't made it on to this blog but have been reported elsewhere. I will only bet on a new iPhone, but there is also a chance that Apple may launch a new iPad Mini and a new iPad. But I will not guarantee it. The thing about the iPads is that there haven't been enough leaks to convince me that we'll see new models next week. There have been a few plausible leaks here and there, including a new iPad Mini shell and components for the new iPad, but nothing like the leaks we saw in past years. Remember, when the iPad Mini launched we knew everything but the price and ship date. And we knew nearly as much about most of the past iPhones before they launched. But we don't have as much info about the new iPad and new iPad Mini, so there's a fair chance that they won't be launched next week.